Provide comfort for the family of Santina Di Domenico with a meaningful gesture of sympathy. Passed away peacefully surrounded by family at the Brantford General Hospital, on Sunday April 7th, 2019 in her 88th year. Reunited with her beloved husband Alvio (1996). Devoted mother to Andy, Anna (Gerry), and Leo. Santina is predeceased by her sister Delia, and leaves behind her sister Gina (Italy). Dear sister-in-law to the late Elia (Italy), the late Antonio (Elsa, Italy), Clelia (the late Cipriano), the late Giancinto (Ines), the late Tullio and late Clorinda, and Olimpia (Antonio Di Domizio). Santina is also survived by many nieces and nephews and their children in Brantford and Italy. Santina was a devoted member of St. Mary’s Parish and was known for her inner strength and tender kindness. She brought joy to everyone who had the privilege of knowing her and will be dearly missed by all. Friends will be received at the TOLL FUNERAL HOME 55 Charing Cross Street, Brantford. on Tuesday April 9, 2019 from 2pm. - 4 pm and 7pm-9pm. with Parish Prayers at 1:45 pm. Mass of Christian Burial will be celebrated at St. Mary’s Parish, 133 Murray St, Brantford, ON N3S 5P8, Brantford on Wednesday, April 10th, 2019 at 11 am. Interment St. Joseph's Cemetery. In lieu of flowers, memorial donations to Brantford General Hospital Foundation would be appreciated. We encourage you to share your most beloved memories of Santina here, so that the family and other loved ones can always see it. You can upload cherished photographs, or share your favorite stories, and can even comment on those shared by others. Provide comfort for the family of Santina Di Domenico by sending flowers. 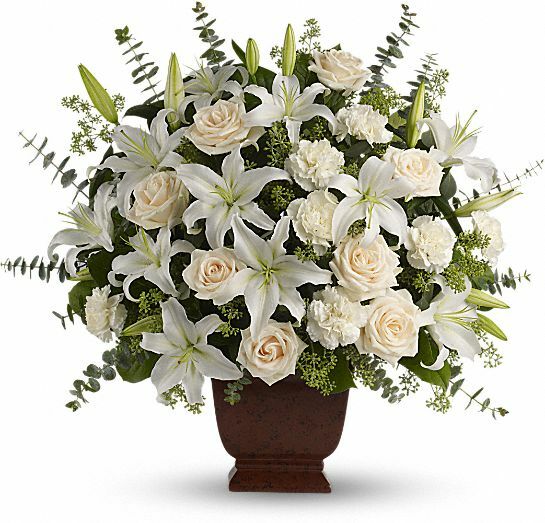 Heartfelt Sympathies Store purchased the Loving Lilies & Roses Bouquet for the family of Santina Di Domenico.